One of the more interesting aspects of writing a blog is seeing which topics attract the most interest. 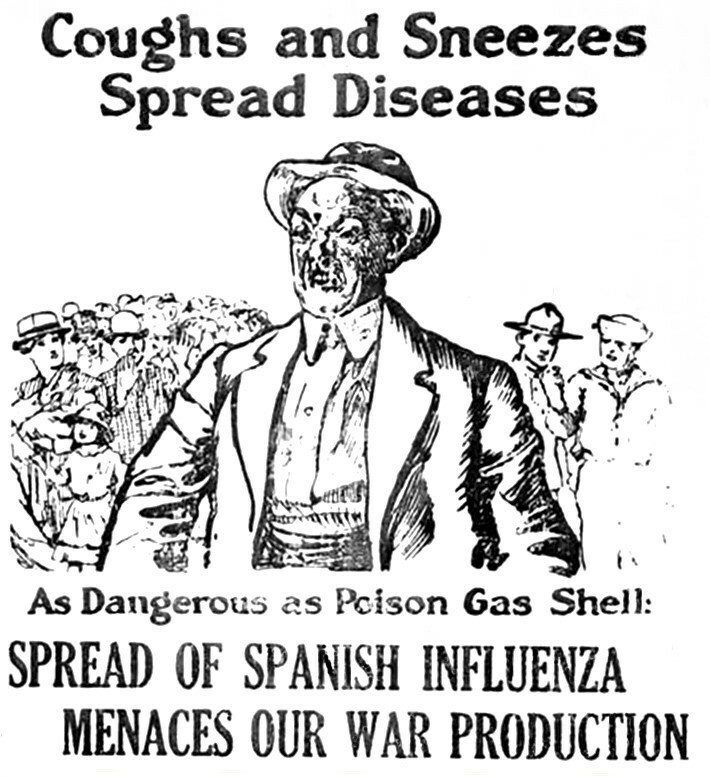 In mid-December, I wrote a post about the Spanish flu (link below) and its spread across Massachusetts in 1918 and 1919. Since then, it’s been one of my most popular posts (placing fourth most popular of the current 45 posts, actually). So, the other day I was reviewing my notes from that post and came across an interesting column (also below) that I didn’t use at the time, but saved for later. Spanish Flu, sometimes called the 1918 Flu Pandemic, was a worldwide pandemic and one of the most catastrophic natural disasters in humanity’s history. Experts estimate that somewhere between 50 and 100 million people died worldwide, and that some 500 million were infected. Stateside, one in every four people suffered some form of the Spanish flu, and the death toll was so staggering that it shortened the average US life expectancy by 12 years during the first year of the outbreak. These days, it’s rare to come across first-hand living memories of the Spanish flu epidemic, now more than 90 years ago. My grandfather, who grew up in Lawrence, Massachusetts often spoke of his memories, but he died more than 35 years ago. That’s why when I came across this column, in the November 1, 1918 edition of The Lowell Sun, I decided to save it. There are a few things that are interesting about the article, from a column called Man About Town. First, I’m also working on a post exploring the linguistic heritage of New England – said more simply, the distinctive accent and unique words and phrases we’re known for. More specifically, I’ve been exploring the idea that we would notice ‘historical accents’ if we were able to talk with people of the past. In the column below, the writer, uses the phrase “issue of even date” in her letter – a term, now obsolete, that she uses to refer to “today’s edition” of the newspaper. 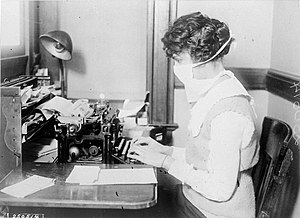 Typist wearing mask, New York City, October 16, 1918, during the "Spanish flu" influenza pandemic. - Image via Wikipedia. Another interesting comment about the letter is the writer’s reaction against the “fresh air” idea that was so prevalent during the epidemic. Soon after Spanish flu emerged, fresh air was thought to be one way to protect against infection. Open-air emergency camps were quickly set up across Massachusetts to treat the infected. And, amidst all of the fear, one newspaper columnist proposed that a messy home and poor housekeeping put people at a greater risk of infection. An irritated reader wrote the following response, taking him to task for assuming that her house was “in a dirty condition” just because the Spanish flu had invaded her home. From the Friday, November 1, 1918. Lowell Sun, Page 18. In your issue of even date you say you wish we could have a national, state, or municipal statute to enforce personal and household cleanliness among industrial families. You state you have thought about it more particularly since the Spanish influenza has been prevalent because the social workers tell you of unsanitary homes (bordering on being in a state of filth) and that this causes the disease to thrive more than any other single agency. A woman wrote this. No name was signed to it, but I can tell a woman’s handwriting and sometimes detect the feminine process of thinking. I rather think she is a good housekeeper and her house is kept in a clean condition. If it got to that point where she wanted me to personally inspect her home and qualify as a judge of a clean home, or, if she had any lingering doubts in her own mind as to whether she was as good a housekeeper as she ought to be, I think here is a situation she and I ought to both sidestep. I think, if judgement must be passed on her home, she and I ought to leave it to the opinion of her family doctor and of the nurse employed. But I am satisfied to believe that this woman’s home is clean and all right. Sometimes, veering off the beaten path of research materials (and into the land of columns and other ‘lighter’ newspaper content) can yield interesting insights into the lives and thoughts of people whose living memories have long since faded. These insights can help us better envision as living, breathing people the names and dates of the individuals who make up our family trees. They can also breathe life into the events and beliefs that shaped their lives and that we now read about in historical accounts. Hey, at least the Man About Town wasn’t snotty or condescending or chauvinistic or anything. He did come across a little . . . umm . . . condescending, even when viewed from a historical perspective. If you are in the Boston area, I highly recommend you check out the BSA Space that just opened in Boston. One of the exhibits on display is from “Where’s Boston?” a multimedia show created in 1975 for Boston’s Bicentennial. There is a column from the original show containing several words that originated in the area. Thanks, for the comment, follow, and ‘likes’. I’m in Boston often and will check that out. A couple of thoughts. The fresh air theory had been popular for quite a while by the time the Spanish Flu hit. Boston City Hospital had open air wards in tents for returning soldiers from the Spanish American War. Ironically, they had built the hospital beside the end of the South Bay, which was polluted with sewage. Also, my Swedish grandmother moved from Roxbury to Quincy to nurse her brother’s family during the flu outbreak. She had a husband and baby son at the time. People did what they had to do. Great blog – I added a link on my blog that will show up soon. Thanks for the link and comment. I’ve enjoyed your blog at goodoldboston too.